We always seem to get the crazy animals that like to live in our backyards. In St. Louis is was first a skunk and then a baby opposum...we've had our share of run ins with animals. 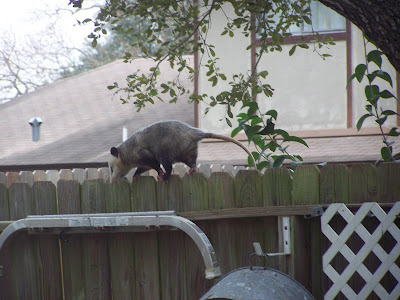 As Naomi and I were having breakfast before heading to church on Sunday I saw this ugly dude walking across the fence. This was like 8 o'clock in the morning. He walked to one side then started back the other way then went back again and finally ended up in the silver "bucket" that you see hanging on the fence. Not sure if this is where he always stays or that he just found it on Sunday. I'm hoping it was a one time thing but knowing our luck he's living there and having babies! Ugh! I'm not brave enough to move the thing otherwise I would but what if he's still in there!? Ah, what to do, what to do!